Electron microscopy image of nanoparticles binding to bacterial pathogens. Nanoparticles have to potential to be effective, novel antibiotics, but so far the reality has not lived up to the promise. Now researchers have found a simple and effective way to boost the bactericidal activity of metal and semiconductor nanoparticles, overcoming acquired resistance [Siemer et al., Materials Today (2018), https://doi.org/10.1016/j.mattod.2018.10.041]. Metal, metal oxide, and semiconductor nanoparticle-based antimicrobials have the potential to tackle these pathogens. The novel antibacterial properties of nanoparticles stem from the release of toxic metal ions, the generation of light-activated free radicals, local heating via surface plasmon resonance, or physical damage to bacterial membranes. The researchers found that reducing the size of silicon, zinc oxide, and silver nanoparticles boosts antibacterial action, while the material itself or surface charge makes little difference. 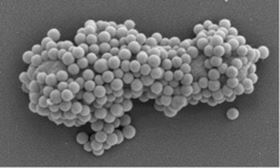 Moreover, the antibacterial action of nanoparticles relies upon their ability to form complexes with pathogens, which enables bacteria-damaging processes to take place more effectively. But complex-formation and, therefore, the antibiotic activity of nanoparticles is adversely affected by biomolecules in the blood or other bodily fluids that attach to particles’ surface forming what is known as a ‘ biomolecule corona’. To overcome this natural propensity toward developing antibacterial resistance, the team found that lowering the pH restored complex formation and antibacterial action in animal wound infection models. “We [have] identified the first resistance mechanism specific to nanoantibiotics, provided an explanation as to why nanoantibiotics show reduced activity in clinically relevant environments, and demonstrated a simple and effective way to boost nanoantibiotics’ bactericidal activity for practical applications,” says Knauer. The approach provides a simple and effective means of improving the antibacterial efficacy and reducing the acquired resistance of nanoparticles that should be generally applicable. Nanoantibiotics could provide new ways of treating drug-resistant pathogens and reducing the amounts of traditional antibiotics used in the future. Exel Composites reports that its carbon fiber components have successfully completed nine years of service at CERN. Structural defects and jagged surfaces of nanoparticles shown to be key to catalysis. PyroGenesis Canada Inc says that over 90% of its titanium powders were shown to be below 106μm and over 50% below 45μm.